It will not be possible to open the tailgate if, for example, bicycles are mounted on a carrier attached to it . Remove the load from the carrier and support the open tailgate. 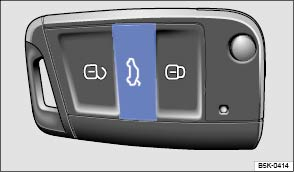 Press the button on the vehicle key for less than approximately 1 second to unlock the tailgate, or press the button on the vehicle key until the tailgate automatically opens by a few millimetres. Then open the tailgate using the Volkswagen badge. Unlock the vehicle or tailgate or open one of the doors. 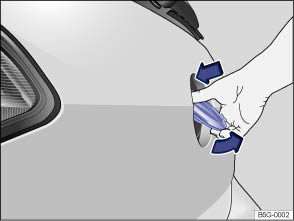 Press the top part of the Volkswagen badge with your thumb and push out the bottom part of the badge. Grip underneath the badge and lift up the tailgate. Serious injuries can occur if the tailgate is unlocked or opened incorrectly or without due care and attention. It may not always be apparent that the tailgate is unlocked, for example when a loaded luggage carrier is attached to it. If unlocked, the tailgate may open suddenly while the vehicle is in motion. At outside temperatures lower than 0°C (+32°F), the opening mechanism cannot always lift the opened tailgate automatically. The tailgate then has to be guided up by hand.